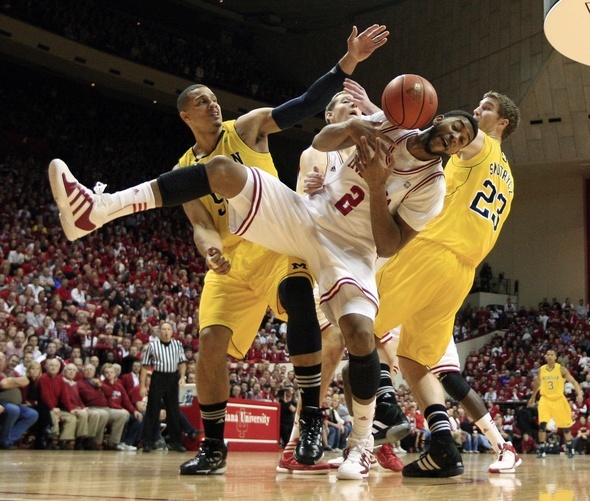 Posted on Mon, Jan 16, 2012 : 5:54 p.m.
Michigan's Jordan Morgan, left, and Evan Smotrycz, right, battle Indiana's Christian Watford last week. The Wolverines frontcourt players will have their hands full with Michigan State senior Draymond Green on Tuesday. Defending Michigan State senior forward Draymond Green is tough enough. But doing so with one post player sidelined due to injury, one in the midst of his worst slump of the season and another with a history of foul trouble? Well, that's just not fair. Through 18 games this season, Green -- a Saginaw native -- is averaging 15.8 points, 10.1 rebounds and 3.4 assists per game. He's also shooting 40.7 percent from 3-point range. He's the only Big Ten player currently averaging a double-double and is integral in Michigan State's league-leading rebounding margin of plus-10.1. And, as usual, the Michigan basketball team will have its hands full with him when the Wolverines host the Spartans at 7 p.m. (ESPN) on Tuesday. Michigan State senior Draymond Green (23) is the only player in the Big Ten averaging a double-double (15.8 points, 10.1 rebounds). He has become tougher to defend this season by shooting 40.7 percent from 3-point range. "He's as good a passing big man as there is anywhere in the country," Michigan coach John Beilein said Monday. "He's as good a rebounder (as anyone in the country), especially at his size. "But what he's doing right now is shooting the ball extremely well from deep. That's the challenge right now." In its efforts to combat Green, Michigan will once again be without sophomore forward Jon Horford, though Beilein hopes to have him back at full-speed practice by Thursday. Sophomore forward Evan Smotrycz is healthy, but hasn't fared very well lately. After posting three straight double doubles, Smotrycz's last five games have seen him average just 3.6 points on 6-for-29 shooting. In fact, when asked if he considered removing Smotrycz from the starting lineup in favor of senior guard Stu Douglass, Beilein didn't exactly say no. "Every game we're trying to look at 'what's the best time to get our five best players on the court at the same time,'" he said. "We're looking at a lot of options right now." Sophomore forward Jordan Morgan has posted a pair of double-digit rebounding performances early in the Big Ten season, but attempted just one field goal in a 16-point loss at Iowa -- and has a history of battling foul trouble. Last season, Michigan succeeded in taking Green out of the flow during a pair of victories over the Spartans. The 6-foot-7, 230-pounder scored just 15 combined points in the games, fouling out each time. But Green has been much more efficient for the Spartans early on this season, and seems intent on making up for two lackluster performances against the Wolverines last season -- calling Tuesday's game "personal." "He just (creates) space on the floor that opens things up for (point guard Keith) Appling so much," Beilein said. "And if you close the floor, he's open. Visit AnnArbor.com for a live chat during the Michigan vs. Michigan State game on Tuesday night. Sports reporters Nick Baumgardner and Kyle Meinke will kick things off from the Crisler Center at 6:30 p.m., 30 minutes before tipoff. Beilein said Michigan had a positive practice Sunday following its ugly road loss at Iowa, explaining how teams generally learn more from a defeat than they do from a victory. The Wolverines went through a mix of live-action practice, film study and weight training Sunday, and will now try to regain energy prior to Tuesday's rivalry tilt against Michigan State. Two days isn't a lot of time to recharge batteries, but for Michigan, it has to be good enough. "We were a step slow with so many things in the Iowa game both offensively and defensively," he said. "I don't know if it was fatigue, if it was focus, over-coaching, under-coaching? I have no idea. We were a step late. "You have to have adversity to grow, it's the best way people get better. You don't want to go through that, but it's essential." Beilein was asked his thoughts Monday about the fact that both Michigan and Michigan State will play each other as ranked foes for the first time since 1998. "I don't know what we're ranked," Beilein said. The Michigan coach says he often times will catch whether or not his team is ranked by glancing at press notes before a game, but generally pays little attention to the national rankings. "You're in a vacuum," Beilein said. "You try to get a pulse on things, I do my radio show, I stay in touch with (local media members), but you don't really look at it. "It's impossible to avoid it, but it's not like we're looking for it." Beilein wasn't ready to get over-dramatic with how important last season's sweep of Michigan State was for his fledgling program. He admitted it was likely important to the Michigan fan base, but for his team, it simply went down as two quality victories. "It really helped us get into the NCAA Tournament," Beilein said. "For the water cooler, for fans, I'm sure it was a satisfying time. But for us, it was two great wins over a really good team with a great coaching staff and great players. "And, it helped us get into the NCAA Tournament." Tue, Jan 17, 2012 : 4:20 a.m.
We are Meechigan and we don't say &quot;its not fair.&quot; Let's rewrite this article please. Tue, Jan 17, 2012 : 3:33 a.m.
Paperstreetsoap, is that a game like rock, paper, scissors? Never speak of &quot;Fight Club&quot;, there is no &quot;Fight Club&quot; Anyway, Go Blue and beat State, protect your home turf. Gotta get this one, 3 tough road games coming up. Tue, Jan 17, 2012 : 1:48 a.m.
Tue, Jan 17, 2012 : 12:29 a.m.